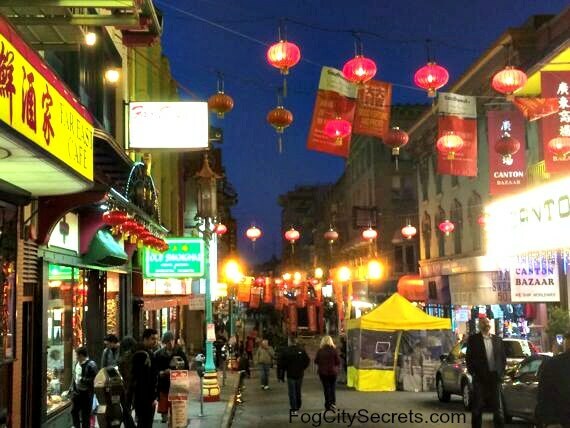 San Francisco Chinese New Year 2019: tips from a local! Chinese New Year arrives on Tuesday, February 5, 2019. 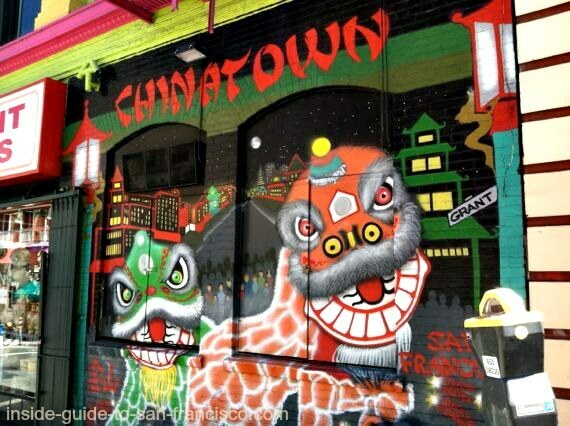 Year of the Pig in San Francisco with tips from a local! 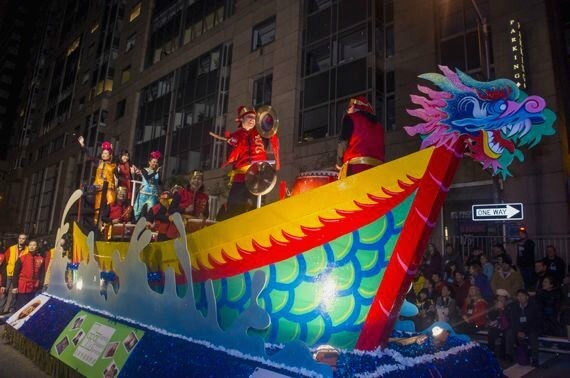 The Chinese Lunar New Year falls on February 5 for 2019, and San Francisco celebrates for two-and-a-half weeks, ending with the colorful Chinese New Year Parade on February 23, 2019. If you're visiting the city around this time, you're in for a treat: parades, street fairs, fireworks and lots of friendly energy! 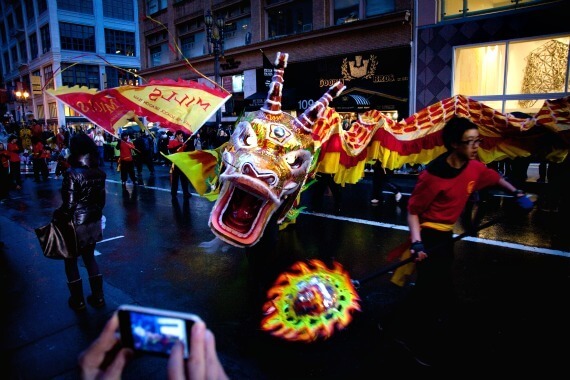 San Francisco has one of the biggest and oldest Chinese New Year celebrations outside Asia. Around 500,000 people come to the events here, so be prepared for crowds! When: Saturday, Feb 23, 2019, 5:15 to 8 pm. Where: Starts at 2nd and Market, goes down Market to 3rd St, up Geary to Powell, right on Powell for one block, then right on Post down to Kearny, left on Kearny, then along Kearny all the way to Columbus. This year it goes all around Union Square; somewhat different route from last year. The parade is loud and full of life. Group after group of dragon dancers, acrobats, martial arts displays, elaborate floats, costumed marchers and stilt walkers. Lots of pounding drums and firecrackers! Something to be experienced at least once in a lifetime; many people go year after year. I scoped out the route the parade will take. See my tips on the good spots to watch from, and photos of the parade route at parade tips. The two sets of bleachers along the route provide a good view of the parade (and a guaranteed place to sit down). 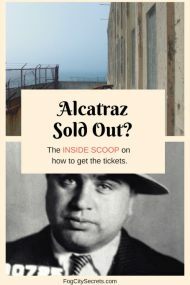 Each seat is $35; you can book them here. To see what the bleacher seating looked like in a recent parade, go to bleacher seats. Get there early (by 4:30 at the latest, 3:30 for front row spots). Dress warmly, and bring an umbrella; the parade goes rain or shine. Book a seat if standing is a problem (see above). Driving and parking? Book a spot in advance in a garage, with a parking app (see below). If you can, stay till the end, because you'll be treated to the sight of the Golden Dragon. The huge dragon is all lit up, over 200 feet long, and carried by 100 dragon dancers; this is the Grand Finale of the parade. Drums, firecrackers, and magic! Can't get there? You can also watch it live on TV. Two local stations will carry it: KTVU Fox 2 and KTSF Channel 26 (6 to 8 pm). Or watch it online, at http://www.ktvu.com/news/ktvu-live-stream or via the KTSF app for mobile devices. The KTSF broadcast will probably be in Chinese. By car: streets along the parade route will be closed at 4:30 pm, and traffic will be ugly, but you can still drive in and park. But garages will fill up fast; booking a spot with a parking app ahead of time is a safer bet. Caveat: sometimes garages have higher rates for special events; another reason to book ahead. Fifth and Mission Garage, 833 Mission at 5th Street. 550 Kearny Garage (valet, enter 665 Sacramento Street). Portsmouth Square Garage, 733 Kearny at Clay. Tip: The Portsmouth Square, Union Square, St. Mary's Square, and 550 Kearny garages are all on the parade route, but the last two have access from other streets, so you can still get in and out during the parade. The Portsmouth Square and Union Square garages' entrances/exits will be blocked off after 4:30 p.m. until the parade is over. Parking tip: if you plan to drive, book a parking spot through one of the parking apps, like spothero.com, or parkingpanda.com, well in advance if you can. A couple of years back, I found a spot through Spot Hero for $10 for the day of the parade at the 550 Kearny Garage, right on the parade route, so it's possible. But I booked it almost a month in advance. Another good bet is Parking Panda. In the past, I've seen $8 for the day of the parade at the 550 Kearny Garage. The word is, plan ahead! See SF parking apps for a general review of the parking apps available in SF. Public Transportation: it's easy to get to the parade by BART or Muni, but the crowds could be fierce. Best to come a bit early, and maybe hang out in Chinatown or North Beach for a late dinner afterwards. BART and Muni (underground): Get off at the Montgomery or Powell Street stops, depending on where along the route you plan to go. A number of bus routes go to this area. 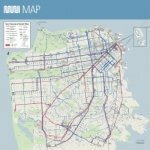 Check out the downloadable pdf from the city that shows all the bus routes: Muni System Map. When: Feb 2, 2019: 10 am to 8 pm. Feb 3, 2019: 9 am to 6 pm. Where: along Grant Avenue (Clay to Broadway), and on Pacific, Jackson and Washington Streets (between Stockton and Kearny). This is a pretty tradition: city blocks of flowers, fruit trees, and fruit for sale, to welcome in the new year. Chinese tradition associates certain flowers and fruits with good luck, so many Chinese families come to purchase these items to decorate their homes before the new year, to bring good fortune to their family for the rest of the year. 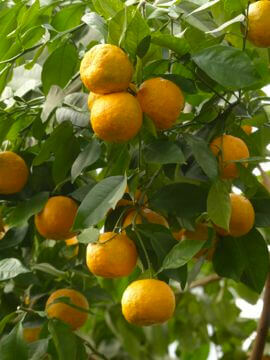 Especially auspicious items: orchids, narcissus, peach blossoms, chrysanthemums, and little trees bearing oranges or tangerines. There will be Chinese opera and lion dancing on the stage as well. Around 400,000 people attend this fair! Very crowded. Held in San Francisco annually for almost 60 years! When: Saturday, Feb 16, 2019, at 7:30 pm. Where: War Memorial Herbst Theater, 410 Van Ness Ave.
For more info, see pageant. When: Saturday, Feb 23, 2019, from 10 am to 4:30 pm. Sunday, Feb 24, 2019, from 9 am to 5 pm. Where: Grant Avenue, (California Street to Broadway), and Sacramento, Washington, Jackson and Pacific Streets (Stockton to Kearny). Walking through Chinatown the night of the parade was magical! Asian Art Museum. Lunar New Year Celebration, Sunday, Feb 17, 2019, from 10:30-4. Lion dancers, acrobats, and story-telling; have your name written in Chinese calligraphy. See schedule. San Francisco Symphony. Chinese New Year Concert, Saturday, Feb 16, 2019, at 5 pm. Reception with lion dancing and refreshments before the concert, Imperial Dinner after the concert. See SF Symphony Chinese New Year for more info and tickets. Bay Area Discovery Museum. The museum hosts an annual Chinese New Year Celebration. Celebrate the Year of the Pig with lion dancers, calligraphy and Kung Fu demonstrations. See schedule for more info and tickets. 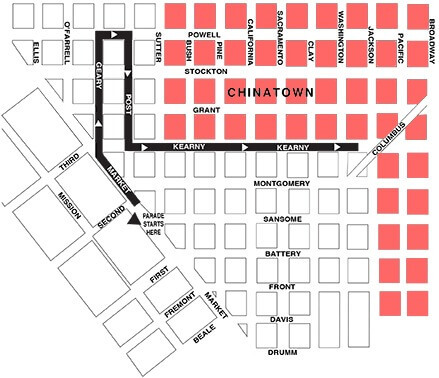 If you're planning to stay in San Francisco for Chinese New Year and want to be in the heart of all the festivities, I've created a list of the hotels on the parade route. See Hotels on the Parade Route for photos and more info. The beginning of the lunar year is an extremely important time in Chinese tradition, because how one begins the year is said to affect one's fortunes for the entire year! Do: before the new year, thoroughly clean the house, put up "spring couplets" (two strips of red paper with good luck sayings...you'll see these sold in the markets), decorate with lucky flowers and plants, buy new clothes for everyone in the family, and have a family reunion dinner. 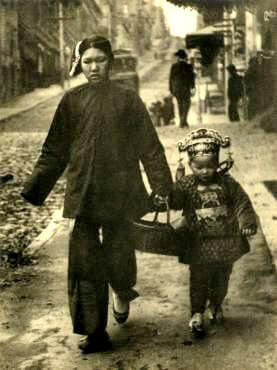 Set off firecrackers when the new year arrives to drive off bad spirits and bad luck. New Year's day: wear the new clothes, give the children red envelopes with money, listen to the ringing of a large bell, show respect to the ancestors' altar (if you have one! ), watch the dragon and lion dancers. Give a special new year's greeting to others. Gung Hay Fat Choi (Cantonese) is not as traditional as some of the New Year's greetings, but it is one of the most popular and well-known locally. It doesn't literally mean Happy New Year but is wishing the other joy and prosperity. Don't: Lots of these! Don't sweep or clean house for two days, or you'll sweep away all the accumulated good luck. Ditto for hair and clothes washing. Don't speak unlucky words (say "death" and you'll be sorry!). Don't eat porridge (brings poverty). More No's: crying children, broken dishes, knives, black or white clothing, no hospital visits, and no borrowing or lending money. And don't give any one a clock or a mirror. Whew! Fortunately, after a couple of days, you can go back to normal and it won't affect the entire year. Chinese tradition divides the year into 12 parts, each associated with one of the 12 animals of the Chinese zodiac. A person's character and personality are supposedly influenced by their birth sign. Who is this pig? He's a kind and gentle fellow, inclined to be a bit too trusting. He's a hard worker, with a positive attitude, and tends to avoid risk in careers and business ventures. The Pig is quiet and doesn't talk much, but he usually has a lot of friends due to his warm and helpful nature. His boundless supply of energy goes into getting things done. 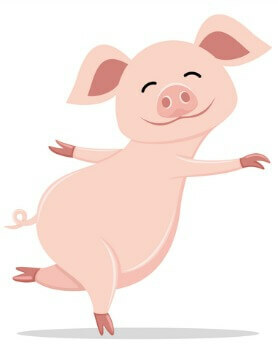 The Pig is associated with good fortune and wealth. Will the Year of the Pig be a good one or a bad one? The answer depends on which sign your were born under; Chinese astrology is complex and each animal interacts differently with all of the others. As happens every year, it's not usually a great year for those born under that year's sign (pig years: 1923, 1935, 1947, 1959, 1971, 1983, 1995, 2007, 2019). For better luck, wear a red item given you by an older relative. Or just ignore the whole thing and enjoy the festivities! I've scouted the 2019 parade route for the best viewing spots. Here are the results, with photos.